Man EURO 6 AdBlue Emulator is professional AdxBlue (SCR) emulators for DAF/VOLVO/SCANIA/MAN trucks. New SRS AdBlue Emulator DAF/VOLVO/SCANIA/MAN EURO 6 can use to trucks and other Euro 6 transport. 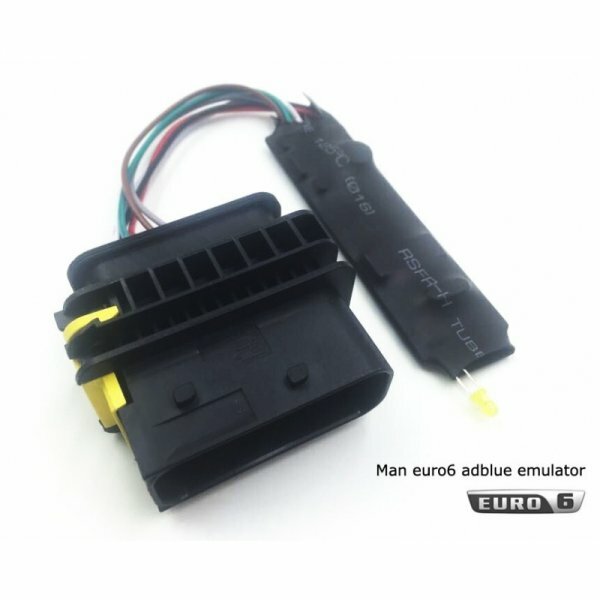 Original Man EURO 6 AdBlue Emulator is possible to disable AdxBlue system by installing an AdxBlue emulator. AdBlue emulator EURO 6 Man EURO6 AdBlue Emulator is Original, unique, and professional AdxBlue (SCR) emulators for DAF/VOLVO/SCANIA/MAN trucks and other transport. OBD2Tuning.com kindly note: It is possible to disable AdxBlue system by installing an AdxBlue emulator (programmable device) into the vehicle. You can switch it on/off anytime. If you want to reduce the consumption of AdxBlue in your trucks or even completely disable itâ€™s function, best solution is to install Adxblue-off emulator. We recommend Generation II. Mulator Man Euro 6 not need to be learned. We Mount emulator under the metal cover of AdBlue Pump. On the right side behind the cab. We need disconnect plug from AdBlue Pump and connect emulator. Fuse F1109 is the fuse of NOx sensor Downstream and A1191 mufler temperature sensor. This sensor need to work correctly for DPF regenaration. The last thing that we need to do is remove Power from NOx downstream sensor. There is two way to do that. Cut pin 1 in NOx sensor plug. The second way (better) is remove pin 10 in X3212 plug. This plug is visible on rear of engine, right side. This is TE plug (16 pin) wiht yellow key.